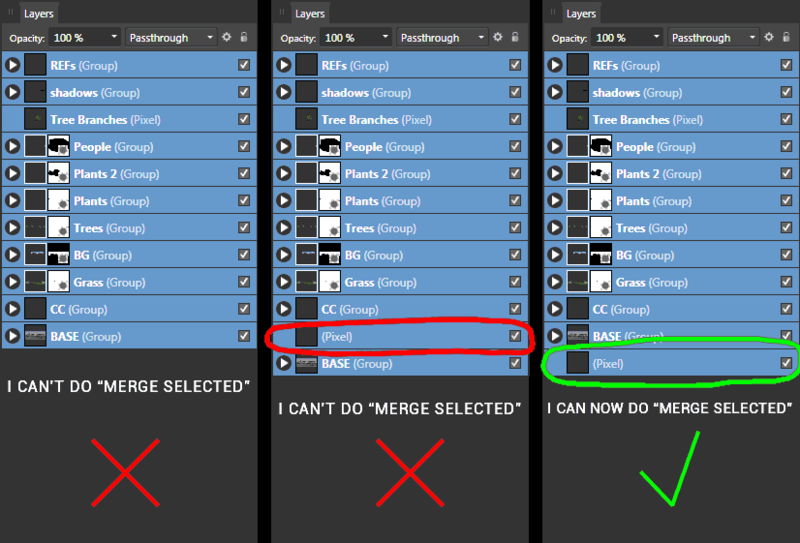 I can't do "Merge Selected" (Ctrl+Shift+E) if there's no pixel layer at the bottom of the selected items in the layers list. In the help pages it doesn't say that the bottommost layer of my selection has to be a pixel layer. It is the intended behaviour to need a pixel layer at the bottom for the merge selected to happen. If not the this option is usually greyed out. However the bug here seems to be if that you have another pixel layer selected, the option becomes active again but doesn't do anything. I shall get this passed over.